'The Post': Pentagon Papers Put The Press Under Pressure Steven Spielberg's account of the publication of the Pentagon Papers in 1971 is melodrama, but Bob Mondello says it's urgent — and effective. Ben Bradlee (Tom Hanks) and Kay Graham (Meryl Streep) grapple with a big decision in The Post. But this story is big. We begin with Defense secretary Robert McNamara (Bruce Greenwood) talking with staffers on a plane about how badly things are going in Vietnam — but then, when talking to reporters the moment they touch down, praising the progress the U.S. is making. Staffer Daniel Ellsberg (Matthew Rhys) registers this disconnect, and leaks a top-secret government report on the war to the New York Times. And whenever the Times gets a scoop, Washington Post editor Ben Bradlee (Tom Hanks) gets riled. Today, of course, the Washington Post is a brand name. In 1971, it was an underfunded, family-owned paper, making its first stock offering with a perceived disadvantage. The recent death of publisher Phil Graham had left his wife Katharine (played here by Meryl Streep) at the helm. Bradlee's ambitions were not modest, however. He just needed time. And now, suddenly, when the Post also got their own copy of the report, he had it. 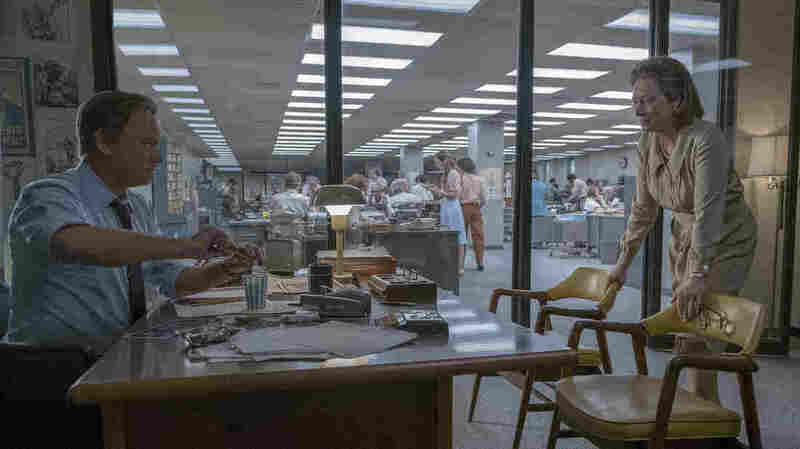 Though The Post seems to fit squarely with Spielbergian histories like Lincoln and Schindler's List, there's a definite Ark-of-the-Covenant vibe to the film when the box of Pentagon Papers arrives, and an Indiana Jones urgency to the frenzy that follows, because the Post had hours to sift through thousands of pages and do what had taken the Times months. The film isn't Spielberg's subtlest, but it has some nicely subtle touches, like when his long-lens camera peers through White House windows to catch glimpses of a president and his henchmen; we hear their actual voices from tapes Nixon was forced to give up, years later. It's a film where the clatter of typewriters competes with the whoosh of pages sent by pneumatic tube to a pressroom where molten lead turns them into lines of type. Tom Hanks makes for a blustery Ben Bradlee, and Meryl Streep plays Kay Graham as hesitant but steely, seemingly the only woman in the corridors of power — and ironically, the one with the power to defend the First Amendment. Bradlee can talk principle all he wants — and he does here, often — but only Graham can publish. It's melodrama, but effective, about an age where the First Amendment means something, where a power-mad president gets called to account by a crusading press, and where a woman can not just find her voice but ..... well, as Spielberg does in The Post, I should let you fill in the blanks. Trust me, you will.